Beautiful views of Long Lake. 35' Down gentle stair to sandy/stony, shallow swimming area. 100' of private waterfront. Cozy finished cottage with amenities of home. Furnishings are family mix. Conveniently located about 8 miles from Naples Causeway, marinas, restaurants and activities. Pine and cedar interior paneling, exposed beams and year round heat. Fantastic swimming in the summer, great location for spring and fall hiking and beautiful fall colors . A short flight of stairs to the water. Has a Dock that can accommodate 20ft +/- of boat. Long Lake - about 11 mi long and variable up to a mile wide. Town of Harrison at the north end and the town of Naples at the south end. We had a wonderful time at this home with my family. My grandchildren spent everyday on the dock fishing and swimming. They loved swimming out to the raft. My husband and son-in-law took our boat out fishing and found it very easy to tie up to the dock. I really enjoyed the deck, it was sunny in the morning and shady in the afternoons. My daughter and myself really enjoyed the fully equipped kitchen. We really didn't have to bring anything from home. The big windows in the front of the home was great as we could see the lake from every room. The house was also very clean and well maintained. Being a senior I was concerned about the stairs to the lake, however the owners were correct. As they were wide and not steep. I was able to go up and down with no issues at all. The lake was so clean you could see the bottom and they had a nice sandy area for the swimmers. We will be back, as this was a great a vacation home for my family. This was our second year at this lovely cabin. immaculately clean, well furnished kitchen, cozy, great views with wonderful sun all afternoon and gorgeous sunsets. We caught a 3.8 pound small mouth off the dock and perhaps 25 bass across the lake from the cabin. Boat tie-up is great with a huge dock for swimming, fishing and sun bathing. This is a splendid cottage close to skiing in the winter for 4 season enjoyment. This was most likely our 4th or 5th stay at this wonderful property. The house is always clean and comfortable, and this year we discovered that the kitchen has every pot, pan and utensil you could ever ask for! But the thing that keeps us coming back are the great sunsets from the west facing deck and dock and the great way our boat fits nicely at the dock. After fifteen years of boating on the lake, this winter we purchased a new boat at Harrison Marina, and enjoyed it daily knowing we had a great evening at Long Lake Pines to come back to. This is as good as it gets on Long Lake! Stu and Cathy are great! We were very pleased with our first stay at Long Lake. The property was portrayed accurately in the description. It was clean & well maintained. I loved the knotty pine and window views. We enjoyed the deck and the docks. The kitchen was well stocked and we enjoyed the games and loads of books available. My one recommendation would be a fire pit. 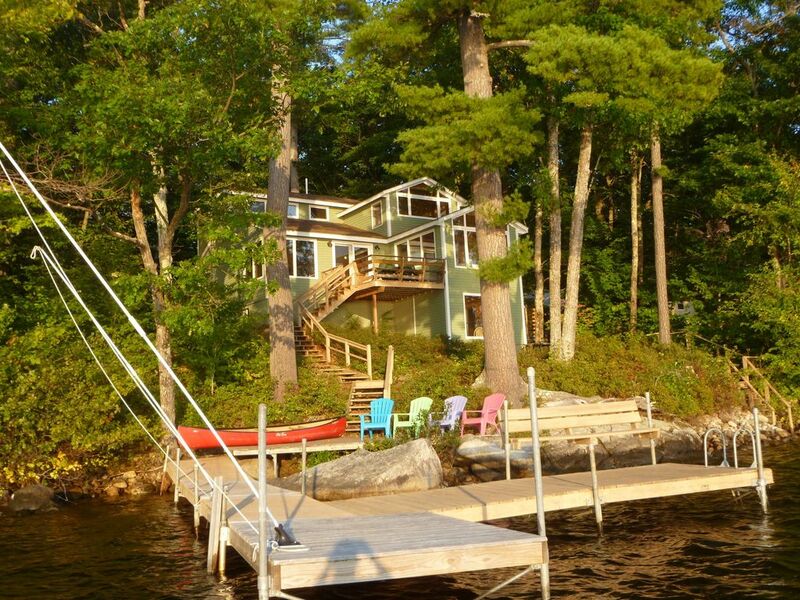 This seems to be the one missing element of a Maine cabin. Other than that we thoroughly enjoyed our stay and would definitely recommend to others. Hidden surprise: this side of the lake enjoys gorgeous evening sunsets! I brought a family of 8 to stay at this rental. It was an awesome vacation. Stu and Cathy were timely with all the information needed and were very responsive while we stayed at their home. The property is well maintained and clean. There are 2 full baths that were really clean. The beds were comfortable and rooms are large. The pictures don't do the property justice. The living room view of the lake is magnificent. The tall trees and location of the house on the lake is so serene and lovely. We made day trips to Mount Washington, Pemaquid Light House, Portland & Cape Elizabeth, Popham Beach, and Freeport Outlets. This kept us entertained for 5 days. At night we cooked at home. The kitchen is huge with tons of counter space which made cooking enjoyable. There aren't many channels but at night we hooked up our laptop to the TV and streamed HBO GO for late night movies (as there isn't much to do past 9 or 10).